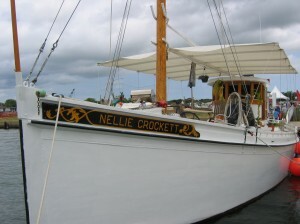 A wonderful example of Chesapeake Bay maritime know-how! The first weekend of August this eleventh year of the third millenium proved to be truly memorable for Cape Charles residents and visitors alike. Jam-packed with activities that began the month-long celebration of our historic Town’s 125th anniversary, there was something for everyone of all ages to enjoy, including open house tours of several of Cape Charles’ beautiful historic homes for sale. 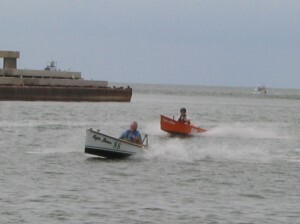 The Harbor of Refuge of Cape Charles is, of course, no stranger to working watercraft of the Chesapeake Bay. Its first 60 years of service as a transportation hub for the railroad and steamship industries attracted many hundreds of Chesapeake Bay workboats such as log canoes, skipjacks, bugeyes and deadrises that worked the plentiful and famous oyster reefs of the Bay. Unfortunately, since the late 1950’s, the oyster populations in the Bay have declined substantially due to over-harvesting of the resource and decimation by an oyster virus. Slowly but surely, these wooden workhorses of the Bay have fallen prey to abandonment and rot until there are very few examples of these splendid watercraft left afloat. 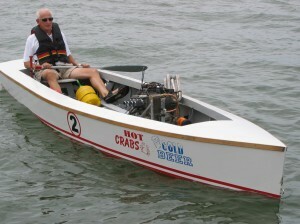 A tall bow helps these heavy boats plow through the steep swells of the Chesapeake Bay. No one wants to glorify the overfishing that in large part caused the decline of this valuable fishery, the oyster, a “keystone” species of the Chesapeake Bay watershed but appreciation of the design and construction of these historic wooden watercraft is part of the preservation of the Eastern Shore’s rich nautical heritage. ( In fact, the not-so-humble oyster was so important to the Shore that over on the Seaside, less than 10 minutes from Cape Charles, sits the quaint little town of Oyster, Virginia. ) Traditionally, these “buy- boats” cruised the waters of the Bay, buying oysters and clams, dredging for oysters and in general hauling lumber, farm produce and other products from the Eastern Shore to market. Historians believe that there are maybe thirty of these “buy-boats” left in the Chesapeake Bay. Another that is still known to be afloat is in Honduras in Central America of all places. 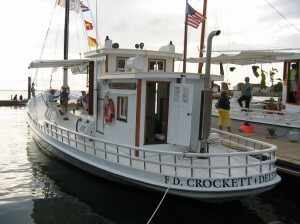 A fleet of twelve buy-boats from as far away as the Sassafras River arrived in the Cape Charles harbor as a culmination of their weeklong annual cruise reunion. This is the first time they have visited Cape Charles, as the Town has now completed the installation of new floating docks which will accomodate fleets such as this. 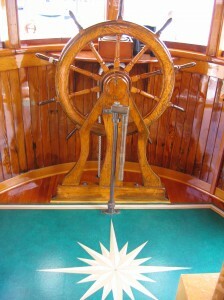 The ship’s wheel where the captain steers these heavily laden craft safely into port. The fleet of buy-boats arrived Thursday afternoon and Cape Charles’ Harbormaster Smitty Dize and his hardworking crew were prepared to tie them up on B dock where they could all be observed together by the hundreds of eager fans awaiting their arrival here. As Blue Heron Realty Co. is an avid supporter of efforts to revitalize the Town of Cape Charles, we had signed up to sponsor the first Cape Charles Harbor Boat Docking Competition scheduled to take place Sunday afternoon and one of the highlights of the buy-boat reunion here. So we were invited to the VIP party Thursday evening at the harbor and allowed very easy access to all the buy-boats and their owners, captains and crew. 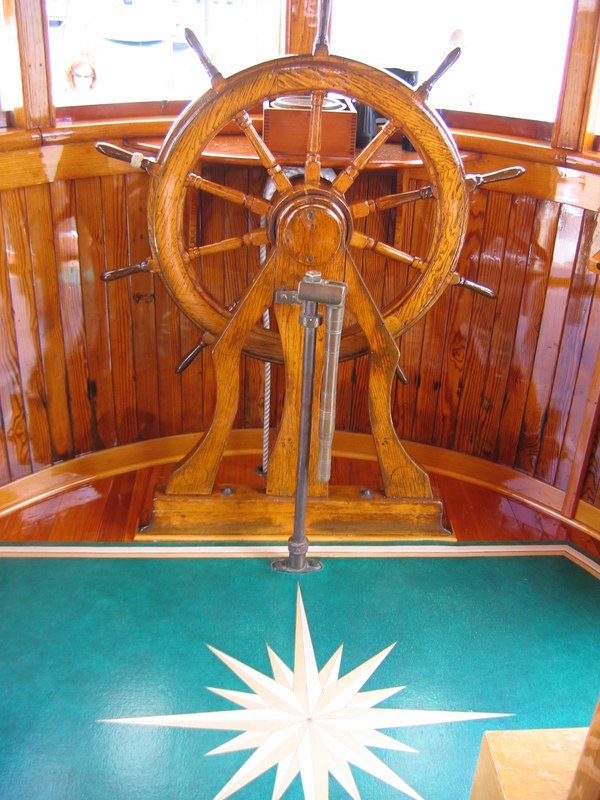 I was readily invited aboard the buy-boats for first-hand tours, their captains proudly displaying for us fans of Bay Chesapeake maritime heritage their beautifully restored and maintained boats. Pictures really cannot do justice to the beauty and magnitude of these incredible boats. 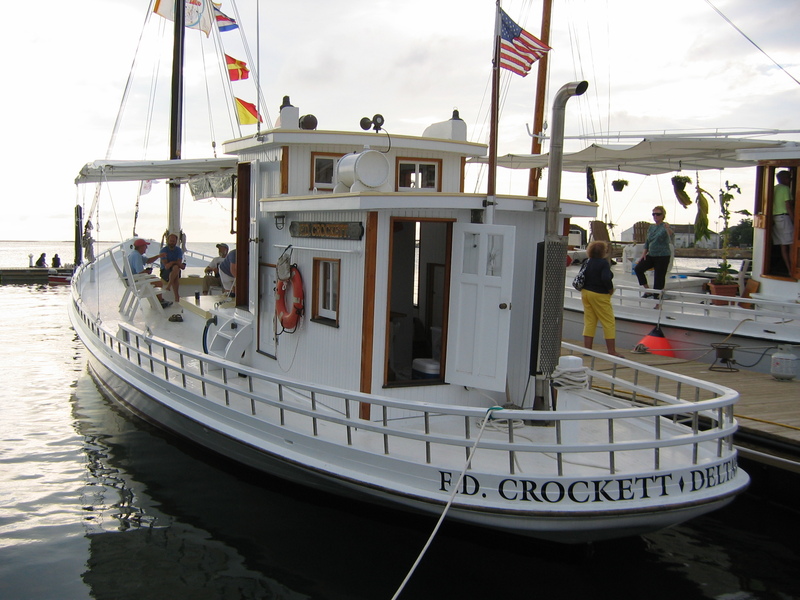 It was more than obvious that owning and maintaining one of these craft is a real sacrifice of time, labor and finances, and the owners that I met expressed without reservation their generous attitude of stewardship in preserving an increasingly rare example of Chesapeake Bay maritime know-how. The citizens of the Eastern Shore of Virginia woke up the week-end of June 4-5, 2011 with not only the tall masts of Kalmar Nyckel dominating the skyline of the Cape Charles harbor but also with the tents of an authentic Elizabethan Faire set up in the Town’s beautiful and spacious Central Park. What a perfect setting for a historic reenactment camp right out of the sixteenth century! To celebrate and compliment the visit of Delaware’s official tall ship ambassador, Kalmar Nyckel, the historic coastal Town of Cape Charles hosted the visit of “Historic Interpretations” from Raleigh, North Carolina. They are a group of actors, historians, craftsmen, and educators who demonstrate in incredible detail what life was like 500 years ago in an Elizabethan village. The day dawned bright and sunny with tangy, refreshing breezes blowing off the Chesapeake Bay. And as the day progressed, visitors from far and near made their way to the Faire and quickly found themselves involved in playing games, dancing, trying on armour, hefting weapons, and admiring the great detail of reproduction of the time period of 1585, or thereabouts, the height of Queen Elizabeth’s reign in England. I brought to the Faire my grown children and grandsons. When I visited the tent of Lord Robert Dudley, the High Chancellor of England, he was so impressed with my son and grandsons that he knighted them all! Now, I have to call them Sir John, Sir Brandon, Sir Charlie, and Sir Ryan, and do their bidding whenever it pleases them – big mistake! 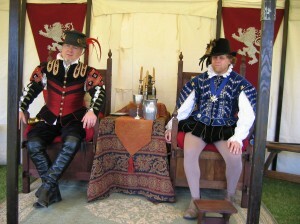 My “Sir” Knights then lead me by the collar around the Park’s field to another tent that sheltered the Armoury. There, to my huge surprise, were racks of weapons from the 16th century – long bows and arrows, 10′ long pikes, and other implements you cannot imagine, all of which could do serious damage to an opponent on the battlefield or the jousting. 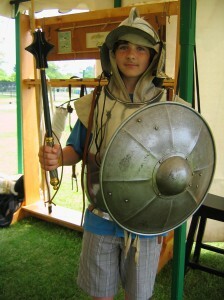 Sir Brandon ready for battle! arena! Suited up for battle there stood a soldier straight out of antiquity! Helmet, breastplate, chain mail … I tapped on his chest and rapped on his head much to the detriment of my poor knuckles! That armour sure is good stuff! My little knight needed some shining armour, so I asked the good soldier in attendance to fix him up. And with Sir Brandon being now officially knighted and all, the soldier had no choice but do his bidding. Then on to the Tavern tent, stocked with good victuals and brew, and furnished with collapsible wooden tables and chairs from the Elizabethan period. 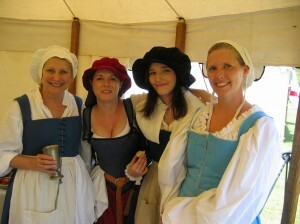 Gathered around the tables were the prettiest Ladies- in- Waiting, beckoning me to play a game of chess or checkers. It didn’t take long at all for Sir John, Sir Charlie, and Sir Brandon to get into the spirit of things and we all broke out in rollicking songs, timeless sea chanteys and Irish tavern tunes. Next thing I knew, the ladies had pulled us out of the Tavern and we were dancing on the Green, stepping lively around in a circle with our hands on our hips, twirling and swinging our partners here and there and everywhere! Catching my breath finally, I broke free and followed my knights further around the Green for some refreshment and relaxation. 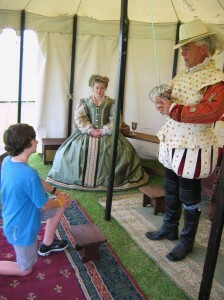 What a wonderful opportunity to learn about the habits and dress and language of the Elizabethans at the time that Sir Walter Raleigh sent his ships across the Atlantic to establish the first English settlements in America, including the historic settlements on the Eastern Shore of Virginia, home to the oldest continuous court records in the US. I heard talk that this troupe loves Cape Charles so much that next year they plan on bringing Queen Elizabeth and her whole court ! Really looking forward to that ! You are currently browsing the Life and Real Estate on the Eastern Shore of Virginia blog archives for August, 2011.